Cloghnagaune is the 985th highest place in Ireland. This is a rather painful hill to summit from the obvious parking spot at the forest entrance to the south east. Following where others have gone I found myself wading through head high gorse to attain the top. There must be an easier way up, perhaps from the graveyard to the west. Apparently Sam MacAlastair, sidekick to Michael Dwyer is buried in the graveyard. It seems that this top may be locally known as Kilranelagh Hill. To the east there is a stone circle at S935 892 A which offers more interest than there is to be found at the summit area. 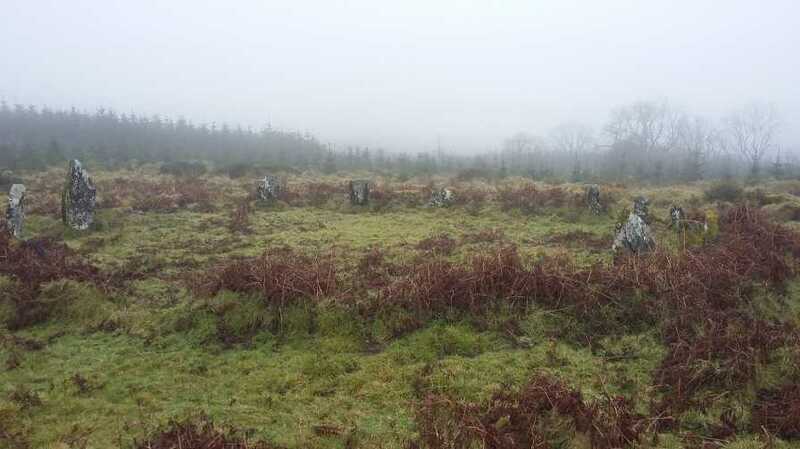 There is also a rath near S932 891 B, but I was unable to locate the ogham stone marked on the OS.